I really want to start doing more outfits of the day posts but I'm terrible at posing and no matter how far my confidence has gown I'm still not totally happy with my reflections. Not unhappy enough to really do anything. On Monday last week I moved to a different office and I'm honestly not happy there. I don't like the location. The office is very similar to my previous company and I'm having odd flash backs and keep thinking I'm seeing people I used to work with. I feel dizzy and disorientated but I'm sure I'll soon get used to it. I'm trying to find the positives. So far, the posh coffee machine (when it's working), The fizzy water tap, The mirrors in the loo's are clear glass and there is a full length mirror. Our previous office had smoked glass mirrors and you couldn't see yourself at all. Monday - Dress Dorothy Perkins Size 20, Cardie Tesco Size 16. 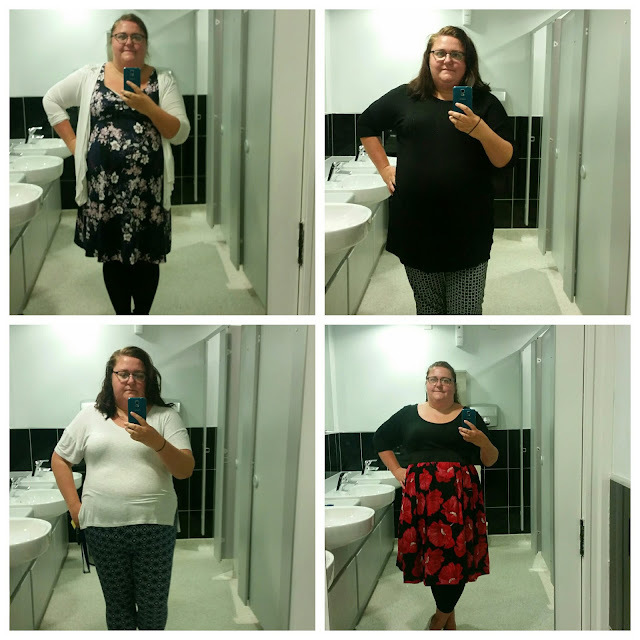 I missed Friday as everytime I nipped to the loo it was busy and I couldn't get the picture but I wore Black Jeggins from Sainsburys Size 22 and a Black and pattern top from ASDA Size 24. My favourite outfit of the week was Monday's dress. I also wore tights which is a rarity for me but only because I couldn't find any leggins. I might wear them again as I didn't feel all that bad in them.